The last time I wrote about the Met Bar & Grill was back in November of last year, but we’ve actually been there 3 or 4 times between then and today. Renee, Tony, and I did a lot of shopping today during the Massachusetts Sales Tax Holiday Weekend which started with a little breakfast and coffee at our favorite Bloc 11 Cafe. After all the major shopping duties were done, we introduced her to the burgers at the Met. 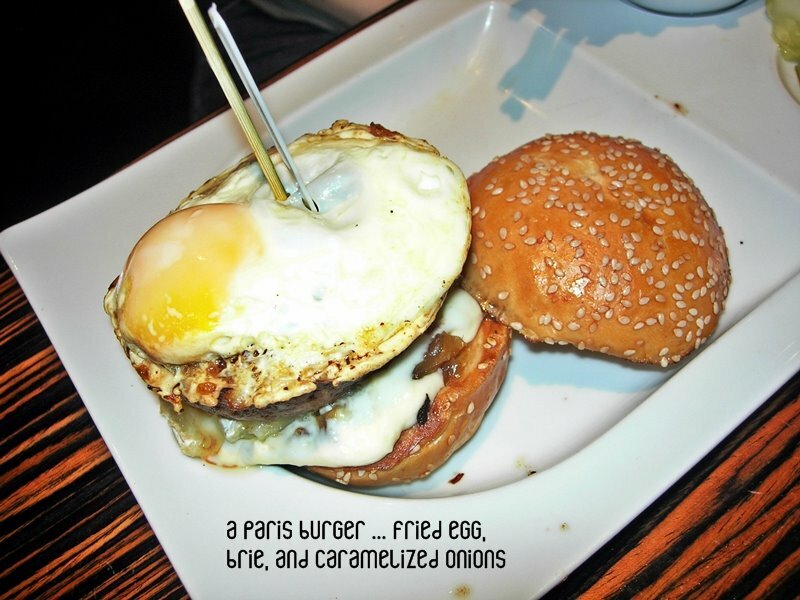 She tried the Paris burger which consisted of a fried egg, brie, and caramelized onions. Yum! Tony had a Met burger with Swiss cheese. We had bad luck with them forgetting to put his cheese on the last two times we’ve been there but thank goodness they remembered this time. 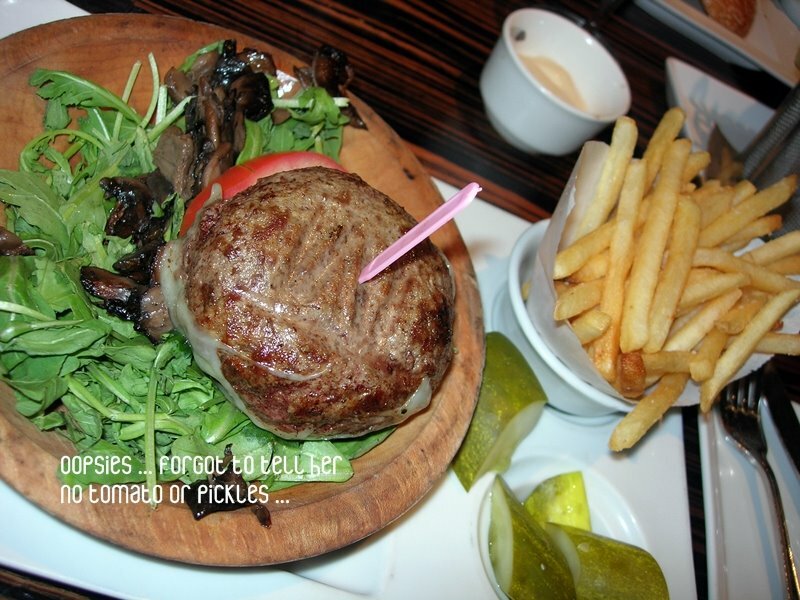 I had my usual bunless Met burger in a bowl with arugula, sauteed mushrooms, and a side of roasted garlic aioli. No kissy kissy tonight with my garlic breath! But the thing that makes you do a Jesus-Mary-and-Joseph is the massive basket of “Sweets & Rings” that comes out and takes up half the table. LOL Okay, maybe not half but you get the idea. This thing was oozing with their yummy, string, onion rings and huge slabs of fried sweet potatoes. Diet? Wha? Nothing but goodness here. And a couple of stuffed pigs. Yikes. 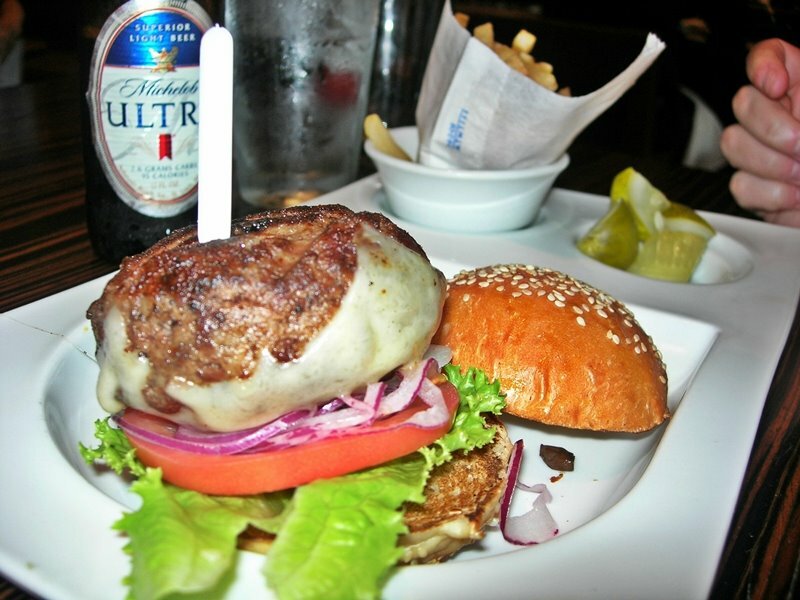 This entry was posted in brie, burgers, met, natick by shortcakescraps. Bookmark the permalink. arugula on a burger. i like it! How was the Met Bar & Grill with your allergies? Hi Tonya – good question! They (as are most restaurants these days) are great about my food allergy issues. In this particular case, I totally forgot to tell them to not include the tomatoes or pickle so it was my fault. We’ve found that a lot of restaurants will ask for patrons to tell them about food allergy issues (generally printed at the bottom of a menu), and I think informing them isn’t as much of a big deal as I used to think it was. I read some posts on your blog about food allergy issues, but I couldn’t find a direct email address to respond to your question. I hope this answers your question! Please feel free to email me if you would like to discuss more about this topic.